Ask fellow campers about "Brown County State Park" and nearby attractions. This is a very large park - it took 15 minutes to get from the park gate to our campsite and it has a few hundred sites. We were on Taylor Ridge, which is heavily wooded. The sites are roomy, and the place was practically deserted in April. Expensive for what you get; 30 amp electric, no onsite water cost $29 plus $9 entrance fee. However it is scenic and well maintained. Central Water station. Excellent nature center with a bird watching area. Lots of hiking trails with varying lengths and degrees of difficulty. We camped at Brown County State Park in a Motorhome. Roads were extremely smooth. Staff was very friendly. The country store was not open for the year to purchase firewood, however there was a gas station open outside the main entrance. We camped at Brown County State Park in a Travel Trailer. I think our rate included the daily fee, but I am not really sure. The roads are hilly and winding, which makes for a very nice drive in the park. We stayed at Buffalo Ridge campground, which was the only one open. The campground is in a completely open area, surrounded by woods, so the outside sites back up to trees. The sites are fairly close together, so it could be noisy if it were busy, I suspect. The bath/shower house seems new and is very clean. Water got warm enough to shower! Apparently this is a mountain bike destination, but there seem to be few hiking trails, which is why I only give it 4 stars. As others have said, don't come in the north entrance, due to the covered bridge low clearance. A nice drive into Nashville, where there are lots of shops and a brewpub. We camped at Brown County State Park in a Travel Trailer. Buffalo Ridge is very popular, especially on weekends as t h e leaves are changing. Site 77 had 50amp electric...surprised, but pleased. Site poles make back in quite tricky. Some shade,close to bath house, fairly level so a nice site. RIvers need to use the West Gate entrance since our rig will not fit thru North Gate covered bridge...make sure your GPS routes you correctly. 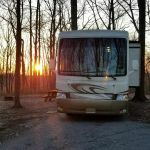 We camped at Brown County State Park in a Fifth Wheel. Fun trails around lakes (but watch for copperheads). Nature Center is informative, camp store is nice plus Nashville IN has fun shops, winery, pub, distillery, candy stores, etc. Brown County State Park is the largest of the IN state parks. During fall leaf season, the views of the hills will be spectacular and the campgrounds will be full. The park is near Nashville. The three campgrounds are Buffalo Ridge, Raccoon Ridge, and Taylor Ridge. Buffalo Ridge and Taylor Ridge have electric sites, while most of Raccoon Ridge does not. (There are also horsemen's primitive and electric campgrounds in a different area of the park.) We camped in Buffalo Ridge Campground the end of September. We were there during the week, so the campground wasn't full and there were very few children. This mattered because our site backed up to a small playground. During the summer, there probably are a lot of kids using it, which means sites 3, 5 and 7 should be avoided if you are bothered by noise and activity. Also, many of the sites are full sun; the park lost over 300 trees to the ash borer in recent years. Don't trust the pictures on ReserveAmerica - they predate the tree loss. Many sites are not level. There is 30 amp electric service at sites, and potable water is available in the campground (no water or sewer at sites). There is an easily accessible dump station. Cell service via AT&T was good at Buffalo Ridge, with a solid 2 bars of 4G LTE. The Verizon hotspot also worked well. We were told that cell reception at the Taylor Campground was not good. There was a clear shot at the SW sky for satellite TV (Dish). The bathrooms were clean and well maintained. Showers, at least in the women's section, had toilet-styled solid doors, but the shower curtain inside didn't do much to screen off the shower from the dressing area. Just be careful. One important note: Enter the park at the West Gate. The North Entrance has a covered bridge with clearance of 9 feet and a weight limit of 3 tons. All in all, this is a great park and we will definitely return! We camped at Brown County State Park in a Motorhome. BCSP has over 25 miles of mountain bike trails. The park has 12 hiking trails that total over 18 miles. There are over 20 horse trails, and 11 are wide enough that riders can ride two abreast. Horseback riders have their own entrance in the park's SE corner, which leads to the horsemen's campground. This large (25 sq. mi.) park is very well managed and maintained. The park roads are all paved and very hilly. There are three camping areas plus an equestrian location, and the camping is separate from the equestrian location. The three camping areas are Buffalo Ridge, Raccoon Ridge, and Taylor Ridge. Buffalo and Taylor have electric sites, while nearly all of Raccoon does not. Sites are all back in, and many are obviously unlevel. Trailers and 5th wheels should be able to make things level, but for motorhomes it might be harder. Buffalo Ridge is likely best for motorhomes. Sites may be paved, gravel, or grass, with Raccoon Ridge mostly grassy sites favoring tents. Price shown reflects a $5 reservation fee, but not an additional 7% sales tax. On first entrance to the park, even those with reservations must pay one day use fee of $7; windshield tags at the campground provide for free entrance on subsequent days. Do not let your GPS route you up the extremely narrow and winding IN-135 (off IN-46) as it goes only to the equestrian facility. The two RV entrances are both directly off IN-46, the north entrance east of Nashville (with a 3 ton, 9 foot clearance limitation due to a covered bridge) and the west entrance west of Nashville. Signs warn of the north entrance limitations. We enjoyed our weekend stay and would stay again when in the area. We camped at Brown County State Park in a Motorhome. There are many hiking trails throughout the park. The small nearby town of Nashville has plenty of shops and restaurants, a touristy area. The real gem, however, is Columbus, Indiana, home of some outstandingly stunning architecture. Two churches, one by Eero Saarinen and one by his father Eliel Saarinen, another church by Gunnar Birkerts (who died this month), buildings by Kevin Roche, I.M Pei, and so on make for a delightful tour of the city. Cummins, of engine fame, is headquartered here. We did a two night trip to view some fall foliage and we where not disappointed. The leaves where past their prime but with the temps in the 80's and sunny the remaining leaves showed us their beauty. The campground was not busy during the week and the camp store had 30% off every thing except ice and firewood. The park is very hilly and is great for hiking, biking and walking. You will have to pay or have a pass to enter the park for the first time. The only low spot was we where invaded by some kind bugs that looked like lady bugs, they seamed to like the warm exterior of the motorhome and then finding their way inside as the temps cooled, we spent the evenings removing them from the inside as we watched the Cubs/Indians games. We camped at Brown County State Park in a Motorhome. The town of Nashville has some very nice shops. We have come to Brown County SP many years. A bonus this year was the new shuttle bus between the campground and Nashville sponsored by the General Store. What a great idea for RVers in motor homes as the town is too far to walk and too hilly to bike from the campground! Camping here in the fall is great - even though it rained this year - we still loved bike riding, campfires, and the holiday lit campsites. With this new shuttle it is even better because a new rainy day option is lunch and browsing in the treasure that is Nashville! We camped at Brown County State Park in a Motorhome. As folks have said, the sites have electricity only, so load up water as you come in. Beautiful park and very well maintained. Bring your firewood with you as they prefer you leave limbs on the ground. Great little campstore, plenty of hiking trails, most of the rv spaces are small - lots of tent spaces and almost all of the camping spaces are on the main road. Lots of people here on the weekends - sold out and this was October 1st. The views are magnificent. Horse trails - and you can even use their horses, mountain bike trails, nature center, playgrounds and I hear there is a lake here but we didn't go visit it. Overall, we are very impressed with this park and will definitely come back - even though we have a 44 foot 5th wheel and most of the campsites will not accommodate us. We camped at Brown County State Park in a Fifth Wheel. Nashville is a quaint shoppers paradise with 4 blocks of all kinds of neat shops well worth visiting. If you're in an RV over 9 feet tall, plan on entering the park via the west entrance - as you will not fit into the north entrance. Local folks are friendly and welcome to campers as their main source of income appears to be tourist. Very friendly and we'll definitely be back. Great big park with lots of great mtn bike trails. We stayed in Buffalo Ridge and it was really convenient to the trails. Big sites, quiet at might. Just up the hill from tourist town of Nashville. There is a bus service to town and back if you don't want to drive. We camped at Brown County State Park in a Truck Camper. Very nice State Park. Sites are spread out over several loops so the campground is much larger than it first appears. The site quality can vary a lot even in the same loop, so choose carefully when making on-line reservations. For instance, our site was level asphalt with a gravel patio area, but some nearby sites were thin, uneven gravel. The sites are electric only with several scattered water spigots available for filling tanks. This is a huge State Park with many hiking, biking, and horse trails throughout. The camp store was well supplied and had longer weekend hours. There are only two dump stations, so wait times on Sunday afternoons can be long. We camped at Brown County State Park in a Motorhome. We camped early in the season and it was wonderful. Big camping spots, clean facilities and very quiet. We camped at Brown County State Park in a Travel Trailer. Nashville has wonderful shops and eateries. We fished in the parks ponds but did not catch anything. Though this campground does not have sewer or water hookups and is electric only, the location of the campsites more than makes up for lack of utilities. We had a lovely campsite under the trees with a short walk to the bathhouse which was clean though simple. The staff is very friendly and helpful. We enjoyed our time in the park, did some hiking and had a campfire. It is conveniently located to the arts town of Nashville where we enjoyed seeing the shops and eating a few meals. This is a beautiful state park that Indiana residents should be proud of. It reminded us of the Smoky Mountains. We stayed in the section called Taylor Ridge. It was beautiful and secluded. Lots were gravel, level and large with picnic table and fire ring. We camped at Brown County State Park in a Travel Trailer. Nashville is a great little town. This park is beautiful. Main bath house is spotless and modern. DNR staff here are Top Shelf. Lodge on sight with awesome restaurant and water park. Big swimming pool. Hiking trails for all ages and skills. Best state park in Indiana in my opinion. We camped at Brown County State Park in a Travel Trailer. Are you affiliated with Brown County State Park ?